We are trusted in the industry for offering superior H-Frame Scaffolding Systems. These are specifically designed to cater the industrial needs. They are available in a variety of designs, finishes, dimensions, and others. 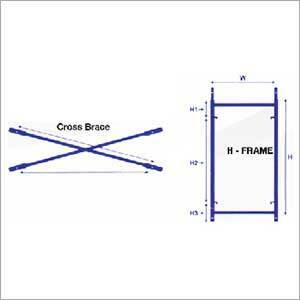 Our offered range includes Standard H Frame, H-Frame Assembly, Cross Bracing, Walk Through Frames, Mason Frames, and more. It shows excellent workmanship, high graded materials and proven methods. Also, our Scaffolding H Frames are dependable and affordable in nature. High performance scaffolding frames in various specifications. Rigid welded frame of vertical & horizontal pipes. The pipes are integrated by scissor type cross braces. Can be customized as per client's details or needs.